I don’t mean the kind of lie where your intention is to deceive, but rather the type of lie where in the moment of telling, you actually believe your own lie to be true. If that sounds a bit confusing, perhaps a few examples will help. You’re doing really well on your weight loss program. You’re eating only those foods which you are permitted to eat and staying well within the quantities allotted. And you’re feeling proud of yourself. While you are busily working away in your office an email suddenly appears in your inbox inviting everyone to the main boardroom for an important meeting. It turns out today is your colleague Brian’s 40th birthday and the “important meeting” was a ruse to lure everyone into the boardroom and enjoy a slice of birthday cake. The plan you are following does not call for cake, yet it is a special occasion. The dilemma: the cake looks scrumptiously delicious and, after all, it would be quite rude and disrespectful to Brian to not partake in the celebration. And so, you make a deal with yourself. It goes like this: you will have a “tiny sliver” of cake and then, to make up for it, you will skip dinner this evening and fast for the next 24 hours. Now, knowing you have arranged to make up for all damaged done by eating the cake, you go ahead and indulge. Of course, by the time you get home you are ravenous, eat dinner, and by the time you wake up the next morning, have completely forgotten the commitment you made to fast that day. Did you lie to yourself? Did you really believe you would honour the commitment you made during your self -negotiation, despite your history of never having done so before? If you can’t relate to that example, try this one on for size. You have committed to go to the gym and follow a rigorous workout program three times per week. Today is a scheduled gym day, but you just don’t feel like going. You are still hurting from the last visit, you have a pounding headache and every moment at work was more stressful than the previous one. All you want to do is collapse onto the couch and turn on the TV. So, the self-negotiation begins. There is a part of you reminding you of your commitment to the gym and to appease that part, you make a deal with yourself whereby you agree that you will skip the gym tonight and make it up by really pushing yourself and doubling your efforts tomorrow. An irritating, nagging voice inside of you points out that you’ve made this kind of deal before and it has never panned out, but you convince yourself that this time things are different, and you really well hit the gym hard tomorrow. Which means you can now watch Netflix with a clear conscience. I would love to tell you that I only know of these deceptions only through other people’s stories and not my own but that would be a far stretch of the truth. I cannot tell you how many times I convinced myself, through deceit, to not do what I knew I should be doing when I didn’t feel like doing it or to do what I knew I shouldn’t be doing when I really felt like doing it. Developing, and forcing upon myself, The Habit of Not Distorting Reality was a life-changing shift for me. From the day I promised myself that The Habit of Not Distorting Reality would always prevent me from deceiving myself and that knowingly (and pretending otherwise) lying to myself was unconditionally inappropriate, I have not failed to achieve single goal I have set for myself. 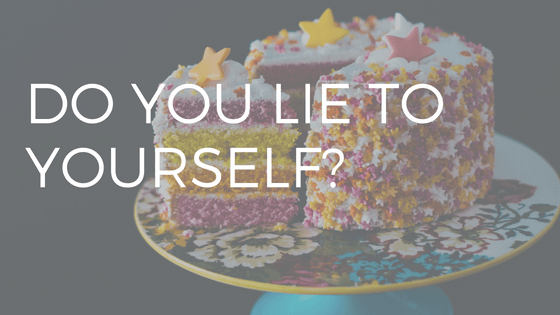 When you lie to yourself, you do provide temporary gratification. But the lie is a thief that takes from us the long-term lives we want in order that we may alleviate a tiny piece of short-term discomfort. So, next time you find yourself in a similar situation, rather than deluding yourself with a story you KNOW is not true, do yourself a favor and tell the truth, after all isn’t that what you would tell a friend to do?